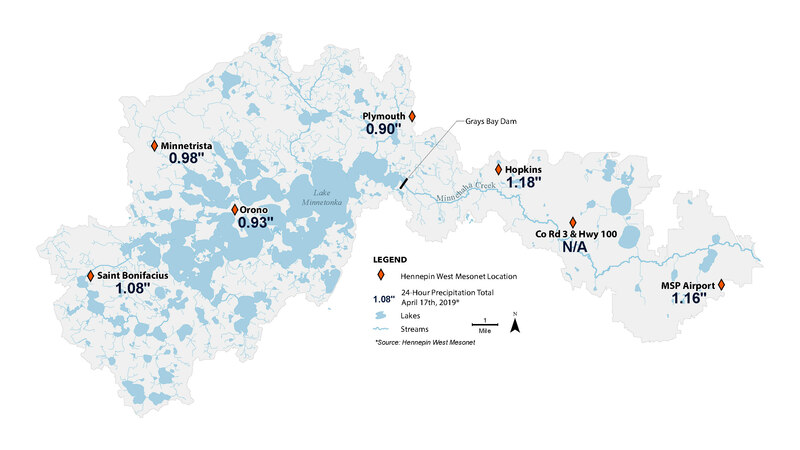 Rainfall totals across the Minnehaha Creek watershed were approximately 1-inch. The map below shows rainfall totals from the Hennepin West Mesonet weather stations across the watershed. Significant winter snowpack (11th snowiest season on record), deep frost, increased soil moisture, quick spring thaw, and recent snow and rain have caused high water levels across the state of Minnesota. Currently 66 of the 87 counties across Minnesota are impacted by flooding, including Carver and Hennepin. Due to this flooding, yesterday Governor Walz sent a letter to President Trump indicating that Minnesota intends to seek a disaster declaration for the recent storms and spring flooding. Due to this situation, Governor Walz has signed Emergency Executive Order 19-30, which declared a peacetime emergency in 64 counties and 3 tribal nations. Because this declaration included Carver & Hennepin counties, both of those counties need to start assessing and documenting damages. What does this mean for you as a homeowner? 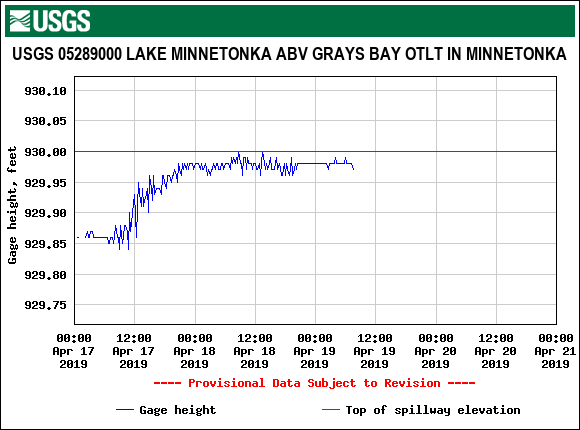 It is possible that Lake Minnetonka’s water level may continue to increase over the next few days as the upper watershed streams drain into Lake Minnetonka. The seven day forecast from the National Weather Service looks relatively dry. MCWD intends to take advantage of this dry weather by discharging maximum creek capacity out of the dam. 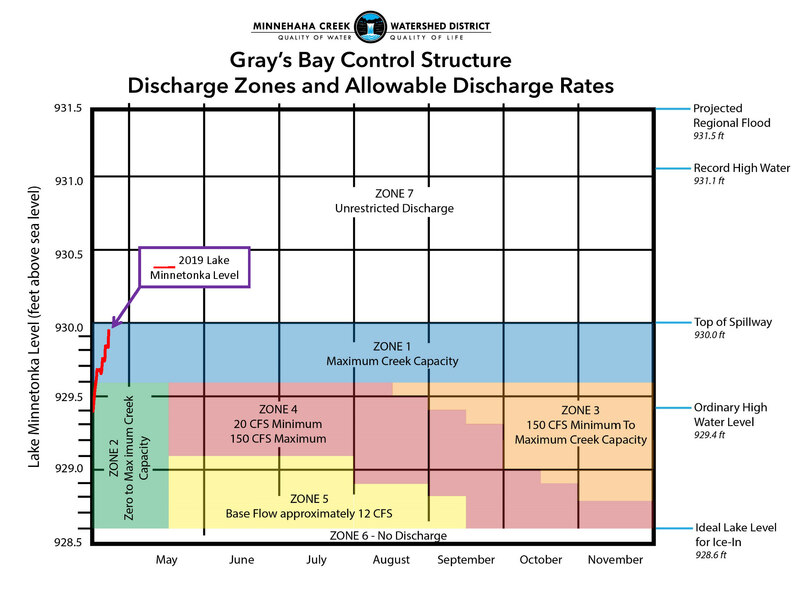 MCWD will continue to coordinate daily with agency partners, National Weather Service, U.S. Geological Survey, and Hennepin County Emergency Management to consult and review data to help inform dam operations. The National Weather Service provides MCWD with seven-day precipitation forecasts and a prediction for how that precipitation will affect water levels. With this information, we can proactively create storage for the forecasted precipitation. Dam discharge can then be reduced before rainstorms and that storage is used to prevent flooding on Minnehaha Creek. MCWD also uses real-time weather data provided by Hennepin West Mesonet weather stations installed on MCWD properties and real-time water level data from the U.S. Geological Survey gauges on Lake Minnetonka and Minnehaha Creek. Get the latest information by visiting our website and signing up for email updates. For specific questions about local flood response, including where to find sand bags and other resources, contact your city.